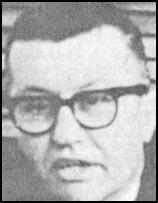 Claims that Lee Bowers' death certificate (DOD August 9, 1966) and autopsy report were missing were discussed on May 6, 1992 as part of Geraldo Rivera's Now It Can Be Told series entitled "The Curse of JFK." These two mistatements of fact by the Rivera "investigators" have been repeated ad nauseam by some "researchers" who never followed up on the allegations. Shortly after Now It Can Be Told aired I traveled to the Dallas Bureau of Vital Statistics at Dallas City Hall. 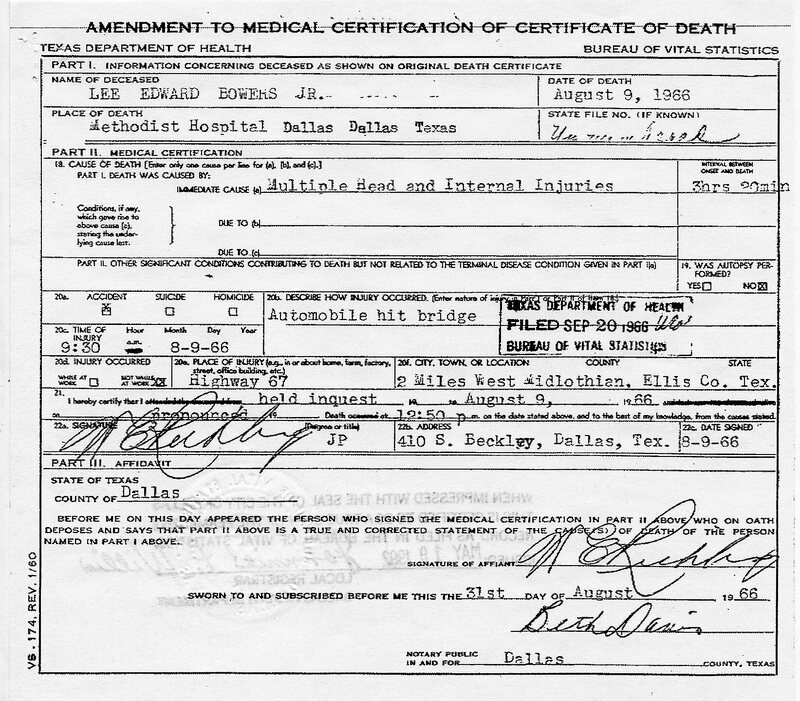 The record wasn't immediately available as death certificates from the 1960s were stored in Austin, TX. Three days later, for the sum of $9.00, I was able to obtain the original and amended copy. 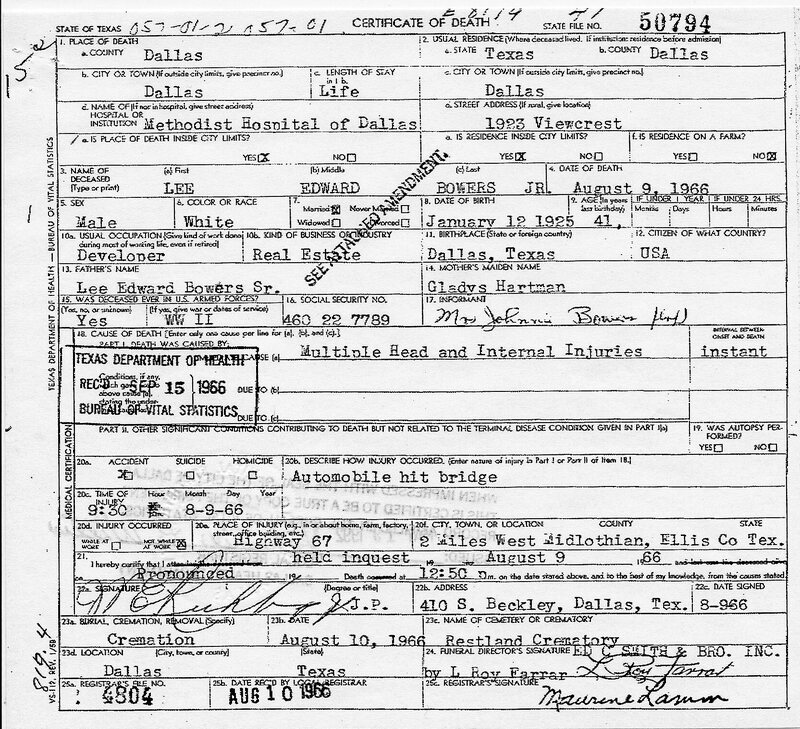 Note the amended certificate changes his name from Lee Bowers Sr. to the correct Lee Bowers Jr. and the "Interval Between Onset and Death" from instant to 3hrs 20min. Instant was used first because the solo ambulance driver from the then Martin Funeral Home thought Bowers was dead before transport. The driver took Bowers from the scene in Midlothian to Tenery Community Hospital in Waxahachie where Bowers was treated by Dr. R.E. Bohl. Bowers and Dr. Bohl were then transported to Methodist Hospital in (Oak Cliff) Dallas. Bower's was prounced dead there 3 hours 20 minutes later.